The Breckland civil parish of Tottington is situated to the north of the much larger parish of Wretham and falls almost entirely within the Stanford Battle Training Area (STANTA). Its name comes from the Old English for ‘the enclosure of Totta’s people’. The parish has a long history, and was certainly well established by the time of the Norman Conquest, its population, land ownership and productive resources being detailed in the Domesday Book of 1086. Setting aside prehistoric but otherwise undateable objects, the earliest evidence of human activity comes in the form of Palaeolithic worked flints (NHER 35598) found in a field to the east of the parish. The only Mesolithic find to date is a flint core (NHER 36261), though this could be Neolithic. Neolithic flint finds include unspecified tools and worked flints (NHER 5063, 35873 and 35872), a laurel leaf (NHER 36256) and a scraper (NHER 37237). A flint knife (NHER 36274), a borer and scraper (NHER 36273) and a core and flakes (NHER 36259) could be Late Neolithic or Early Bronze Age. The Bronze Age has left the remains of the earliest recorded structures, round barrows or burial mounds, two on Flag Heath (NHER 7373 and 7374), one on Lowster Hill (NHER 7380) and one at Waterhouse Lodge (NHER 7381). Many of these mounds were constructed in the county, but few are visible today due to centuries of ploughing. Those whose remains can still be seen in the parish probably owe their survival to the relatively poor quality of the soil, which has made it unattractive to agriculture. A fieldwalking survey from 2000 to 2002 noted the low-lying earthworks of three further possible barrows (NHER 37063, 37064 and 37065) in the southwest of the parish. Other barrows were recorded by antiquarians in the 19th and early 20th centuries but have since eroded away (NHER 7370, 7375, 7376, 7377 and 7378). Iron Age finds are currently limited to pottery fragments (NHER 35598, 35873, 35872 36260 and 36256). A concentration of fragments (NHER 36257) was noted in a field to the east in 2000. Similarly, evidence of Roman activity is confined to pottery fragments (NHER 35872, 36262, 36260, 36258 and 36256). A concentration of fragments (NHER 8943) was noted on a field to the east in 1971. At present, the only Saxon find is a piece of Late Saxon pottery (NHER 36262). The medieval period has left the parish with its earliest surviving building, St Andrew’s Church (NHER 5073). 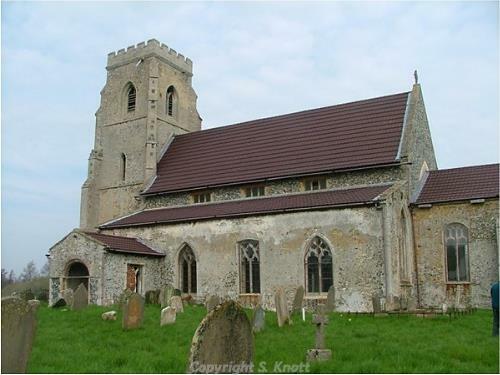 This is a large 14th to 15th century church consisting of a massive west tower, aisled nave, chancel and south porch. It was restored in 1886, when the clerestorey was added to the nave. The surrounding village was abandoned in 1942 when it was taken into the Norfolk battle training area, and apart from the church, only a few ex-council houses remain. The church windows were boarded up until the early 1990s, but the boarding has now been removed and the roof re-clad with steel plates resembling pantiles. The original tiles are stored inside, where there are medieval benches with carved animals at their ends and some interesting memorials. Other medieval buildings have not survived, but have left traces of their surrounding moats. South of the church is a medieval rectangular stream-fed moat (NHER 5065) with a causeway and further earthworks to the north. A sunken roadway leads out to the east. Another moat (NHER 5064) north of Reed Fen is also rectangular and has unusual earthworks to the north including a large raised platform. Further medieval structures have almost entirely vanished, including Tottinton medieval settlement (NHER 33903). Aerial photographs show the cropmarks of an intermittent series of enclosures, partly overlain by existing drains, partly subdividing existing enclosures, which reflect a series of tofts and closes of a deserted medieval village, considerably degraded. The abandonment of the parish in 1942 and its subsequent military use mean that no post medieval buildings remain standing. East of the church is the site of a 17th century and later rectory (NHER 16884). A photograph of about 1900 shows it to have been two storeys high with a rendered façade of three window bays and a central Victorian porch. In ruins by the 1960s, the house had completely disappeared by 1972. Further south is the site of Crossways (NHER 17026), a large 16th or early 17th century house that was in ruins by 1963. An old photograph shows it to have been two storeys high with two wings projecting from the façade. The most historically recent entry on the record is a ruined World War Two pillbox (NHER 32704) standing west of Shepherd's Plantation in the north of the parish. 1946 aerial photography shows that at the time, a searchlight battery and a possible gun emplacement stood in the same area. P. Aldridge (NLA), 8 August 2007.
http://www.norfolkchurches.co.uk/tottington/tottington.htm, Accessed 6 August 2007.